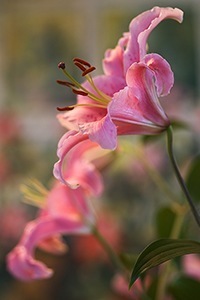 True lilies are among the most elegant of garden flowers. They belong to the genus Lilium and are actually hardy bulb plants. Their flowers come in a wealth of colors and have trumpet or star-shaped flowers – often fragrant – that can be upright or nodding. In some species, the flowers curve back into a rounded or bowl-like shape. These excellent flower garden plants combine beautifully with many annuals and perennials. The flowers are held on top of tall, slender stems, so they are easy to tuck into the garden between other plants. Light: These perennial bulbs grow best in full sun, or light shade (as long as they get some direct sun during the day). When to plant: You can plant in the spring or the fall. Traditionally, specialty suppliers (who have the best selection) would ship the bulbs in the fall only, but with modern storage methods, they can now be shipped in spring as well. You can also find them as container-grown plants in garden centers throughout the season, and you can plant those any time. Depth and spacing: If you have container-grown plants, plant them as deep as they were in the container. They look nice in groups of three to five. If you buy bulbs instead of plants, get them into the ground as soon as possible. The bulbs have fleshy scales and lack the papery covering you see on tulips and daffodils, which means that they can dry out quickly. Plant about two to three times as deep as the bulbs are tall. Set smaller bulbs about 4 inches (10cm) deep and 12 inches (30cm) apart, and larger bulbs 6 inches deep (15cm) and 18 inches (45cm) apart. Madonna lilies (L. candidum) are require shallower planting: they should have no more than an inch (2.5cm) of soil covering the bulbs. Mulch: Cover fall planted bulbs with a layer of straw, fall leaves or pine needles as mulch in late fall. This helps keep soil temperatures even and prevents lifting of the bulbs during freeze-thaw cycles. In early spring, this mulch also helps protect newly emerging growth from late frosts. Fertilizer: If you have good amended garden soil, it isn’t necessary to apply fertilizer. If you have sandy soil or want bigger flowers, you can sprinkle a handful of balanced fertilizer such as 10-10-10 as the plants emerge in early spring, and again once a month until flowering. Watering: For best flowering, these bulb plants need even moisture, so water them well after planting until they are established. Be sure to water deeply every week until they flower, especially if Mother Nature isn’t delivering enough rainfall. Deadheading: Remove spent flowers after blooming to ensure that the plant puts energy into the bulb, not into seed production. Lilies make great cut flowers, but don’t cut off too much of the stem and leaves; if you remove too much foliage, the bulb can weaken in subsequent years. After the stems turn yellow and begin to die back in the fall, you can cut them off at ground level. Pests: Gardeners who love lilies should be on the lookout for the lily leaf beetle. This red beetle is indigenous to Europe and Asia, but was introduced to North America in the 1940s. It is now found in eastern Canada, and has been spreading to the eastern US. Here’s how to control this garden pest.